One of the toughest things in leadership is getting people into action. 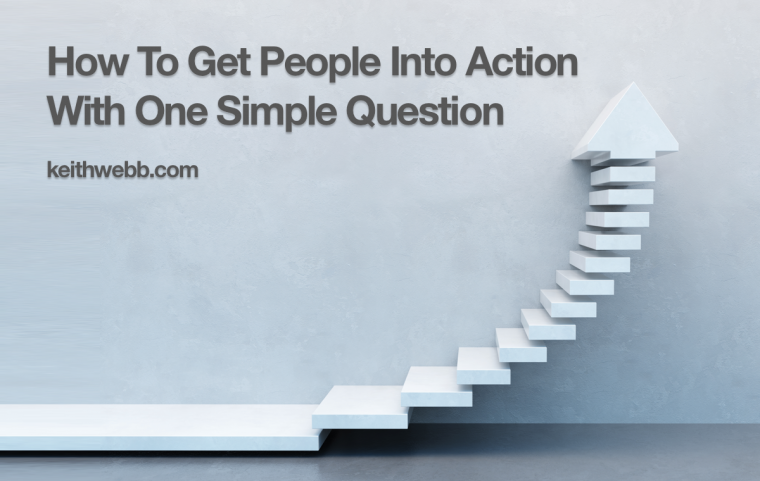 I discovered one simple, yet profound, question that motivates people to get into action. People work hard. It feels like we are in action. We have meetings, plan, write proposals, and consult with others. These activities are one type of action. I think of them as planning-action. It’s easy to let planning-action keep us from the actions that produce something tangible: launch a product or service and generate revenue. I call this implement-action. We need both planning-action and implement-action. It is implement-action, however, that pays the bills, generates market share, and makes an impact in the world. A lot of people are satisfied with planning-action. It feels productive. The ultimate measure of productivity is implementation-action. In my work coaching leaders I’ve discovered a question that will get people into both types of action. Before I share that question, let me speak to why asking a question is better than giving an order. This seems self-evident, but when we feel under pressure the “niceties” go out the window. Asking a question rather than giving an order isn’t just polite, it’s smart. Questions draw out the other person’s thinking, ideas, and perspectives. Questions increase ownership – the answers are theirs. Questions may produce new learning – for them and for you. Questions show respect – for their ideas, thinking, and them as people. Beginning with a question makes a powerful statement about your trust and respect for the person, and creates greater openness to your input. You can always add something of your own during the discussion. What actions could you take to move forward? Simple! But there’s power in the wording. Let’s take a look the construction of this question. What… Begin with an open question that will encourage reflection. “Do you have any actions…” is easily answered with one word answers: no, not really, maybe, or yes. Beginning with “what” makes people think and answer in full sentences. actions… Ask for action, but not just one, ask for actions. Multiple actions will generate deeper thinking and more creative ideas. The results can be combined into one action or perhaps several actions to approach the situation. Think plural. … to move forward? This phrase is the key. “Move forward” allows for a process, next steps, and partial completion. It expects progress without demanding everything to be accomplished with this action. If you ask, “What actions will you take to solve this problem?” you are asking for all-or-nothing. It’s often too much for one giant leap. People will back off and possibly become defensive. Whereas, “… to move forward” feels quite free, while still understanding that you expect progress. You can direct the person to a specific area for action by adding the context to the end of the question. So, it becomes: What actions could you take to move forward on this project? …with your homework? …on becoming a better leader? etc. You can also bridge between planning-action and implement-action by asking: What actions could you take to move forward in implementation? I encourage you to use this question today with a co-worker, child, or friend. Watch what happens to your conversation and the other person’s progress! Question: So, what actions will you take to move forward in using this question? You can leave a comment by clicking here.